Now for the 3rd out of 4 digressions into C-K theory - in part 4 we'll look at the modern 7....Nf6, but for now we'll stick with the main line and examine the consequences of an early ...Qa5+/...Bb4+, which have been tried as an improvement for Black. 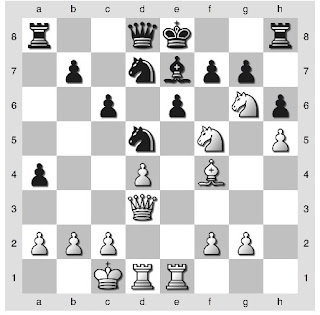 12. c3 Be7 leaves White a choice - in the stem game Karpov-Larsen 1982 White chose the natural 13. Ne4 aimed at d6, but Larsen chose the surprising 13. .... Ngf6! when 14. Nd6+ BxN 15. BxB Qa5 left White with castling problems, though White did manage to win all the same. More often is played 13. O-O-O when ....Ngf6 14. Kb1 a5 15. Ne5 leads to a slight edge for White - he does best to reserve c3-c4 for a later time. and now Black has induced c2-c3-c4 without apparent loss of tempo, he has the added move Qc7. However, this variation is strategically complex because the position of Black's queen is not always beneficial nor is the pawn on c4 always a burden. It sharpens the game, as Black's queenside breaks (c7-c5 or b7-b5, even a7-a5) get more bite, but White has more play in the center. with mixed results - this line is essentially identical to the early c4 lines in the last post where Black also has the sharp option of 16. .... b5!? 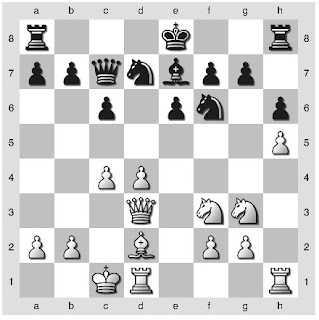 when White often responds with 17. c5 and the game resembles Ivanchuk-Seirawan 1990 posted earlier. White to move....why so serious? 16. Kb1 O-O as in other variations a quick Kb1 has become the vogue at the top level. Why? 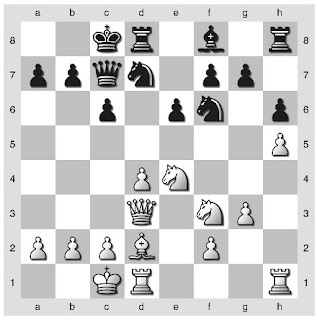 Flexibility - White can play on either the d-file, c-file, or g-file, and waits for Black's response. However, this is not the most critical move. 19. g4!? follows the heavyweight matchup Carlsen-Kamsky 2008 which ended in a draw. Another popular choice is 16. Rde1/Rhe1, putting pressure on e6/e7. Lots of choices! The theoretical debate is still going as can be seen from the recent games. where White has a slight edge because of his space advantage. Conclusion: 11. .... Qa5+ is a topical line that is growing in theory, and is an interesting alternative for Black. However, White has many options to choose from in fighting it, and seems to be able to draw at will if he is so inclined. Meanwhile the sharp c4 lines are still scoring wins for White. Now we come to the key variations in the modern game, where the Caro-Kann starts to resemble a Sicilian Defense with opposite side castling and pawn storms. 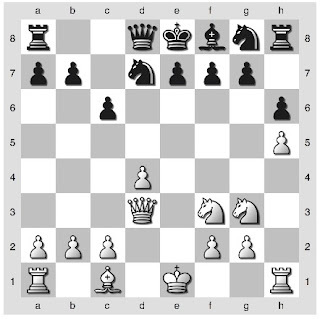 In what Kasparov terms 'Larsen's revolution', it became clear that kingside castling was indeed possible for Black and may, in fact, provide him with more resources. 3) after completing his development, Black frees his game with ...c6-c5: he simply does not have any other plan. Today, however, castling on opposite sides has become the norm, since Black has arrived at a new understanding: kingside castling is by no means an act of suicide! And now White has choices depending on stylistic preferences - 13. Kb1, 13. c4 and 13. Ne5. Behold the pale horse. The man who sat on him was Death...and hell followed with him. This game asks the question - what if Black 'passes' for two moves? This game demonstrates a key feature of kingside castling for Black - both sides must always consider the consequences of White dropping knights on f7, g6, or f5. These strategic risks do not exist in queenside castling lines. However, after the unambitious 13. ... O-O it seems as though White has some trouble maintaining a meaningful initiative against good play from Black. For example the natural looking 14. Ne4 Nxe4 15. Qxe4 Nxe5 16. Bxe5 Qd5 already gives Black equality and White even lost the well known game DeFirmian-Korchnoi 1989 from this position. Why is this? 13. Ne5 is a dangerous looking move but does not slow Black's development or (against good play) meaningfully advance White's attack as the f7/g6/e7 squares are adequately covered. 14. c5! O-O now follows Ivanchuck-Seirawan 1990 (see link for Seirawan's own analysis) - Black has the d5 square but White has, importantly, closed off files on the queenside and maintains his space advantage. 16. Bc1 a4 with complicated play. An interesting follow-up to this game was Ivanchuk-Korchnoi 1993, where after ...a7-a5-a4, Korchnoi preferred to castle...queenside! Black can avoid the committing 13 ... b5!? and prefer 13. ... O-O when the lines can transpose to other options described here. 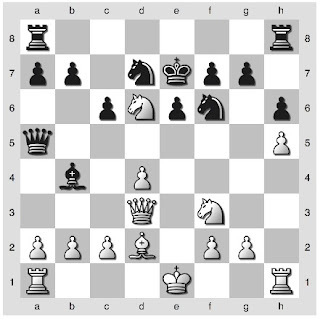 However, if not challenged White does best not to commit to piece exchanges and instead try to find ideal placements for his knights and initiate his kingside attack. In this dry-looking position it turns out there are interesting tactical resources that give White a chance for an edge. For example, after 19. Rhe1! Nf6 (...Nxf2? 20. Rd2 Bh4 21. Ree2! and Black is embarrassed by his wandering knight) 20. g4!? 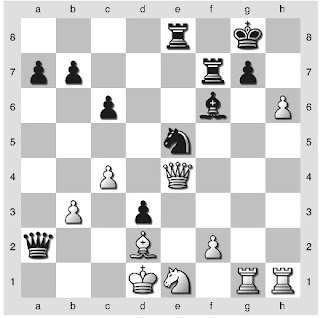 and the endgame was executed to perfection by White in the stem game Kasparov-Anand 2003. White also has the choice of a different and slightly favorable endgame after 19. Be3!? when the ...c5 break has been momentarily suppressed. Key source games include Stefansson-S Kasparov 2001 and Kramnik-Bareev 2003. However, if Black is not in the mood to defend a grueling endgame then more interesting play arises from 13. Kb1 O-O 14. Ne4 Qa5!? 18. Qh3! and this follows Motylev-Willemze 2003 where White converted his attack ultimately into a win, albeit in an endgame. The fireworks were truly on display in Polgar-Anand 2003, where Anand came up with a shocking novelty in a related line, and Polgar managed to draw only with difficulty. Conclusion: Kingside castling for Black carries strategic risks, but it is clearly not nearly as risky as was once thought - indeed the main line goes straight to an endgame. However, a patient player from the White side can either take their chances with the slight edge given to them there, or go for more entertaining fare, particularly 13. c4 where the verdict is unclear. It's not easy, but the 'Kann is all about pain tolerance, time to hit the gym and bulk up. Now it's time to get into some ugly theory. For reference, I'm working off of Gallagher's Starting Out: The Caro-Kann, McDonald's Main Line Caro-Kann, Jovanka Houska's Play the Caro-Kann, and Kasparov's On Modern Chess Part 1: Revolution in the 70's, as well as recent games from This Week in Chess. This time we'll take a look at Black choosing (or feinting?) to castle queenside. This was originally not only most popular but essentially thought to be forced, as castling kingside was thought to be suicide. Bent Larsen, the tireless pioneer, has changed the evaluation entirely and now kingside castling is thought to give Black the best dynamic chances. Nonetheless, queenside castling is still popular at the amateur level as Black's defenses look very solid. To prove otherwise White must play with some verve. Black is going to follow with the moves ...e6, ...Ngf6, ...Qc7 and then potentially ....O-O-O. Order doesn't matter much but note that castling is saved for last on first principles of maintaining flexibility - as we'll see he may change his mind. 10. .... Qc7 (note that ...e6 or ...Ngf6 can be met with 11. Bf4, but after ....Qa5+ 12. Bd2 Qc7 Black transposes back to the main line. 12. c3 is thought not to be best because the queen is well posted on a5 and Black can castle kingside safely). 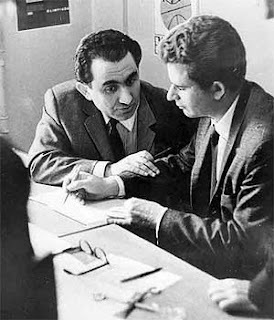 A concept first developed by Spassky and good enough to give him his first win in his 1966 world championship match versus Petrosian. The idea is simply to place a powerful knight on e5 as quickly as possible. 14. Ne5 Nb6 (..c5!? will be examined below; ...Nxe5 leads to a pawn formation that is typically poor for Black in either the middlegame or endgame). A good move which attacks d4, defends f7, and prepares a knight jump to d5. Source games that expand on the position after 17 ....Rd8 include Spassky-Pomar 1968 and Mecking-Pomar 1968, where it was thought that Black had enough resources to hang on for a draw. However, in the modern treatment White does not exchange pieces as early is in the above games, and Black is getting hammered in both 17...Rd8 and 17...Ra5 (65% score for White). Conclusion: After Spassky's 13. Qe2, 13... O-O-O is virtually busted. 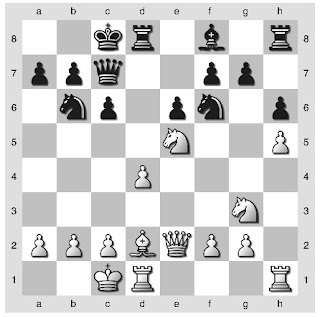 The key move, which required proof that castling kingside can be OK for Black in the Caro-Kann to be discovered. This is where flexibility pays - Black sees 13. Qe2 and decides to change plans, instead asking the question of why Qe2 is a good move? follows Karpov-Hort 1973 which was drawn 3 moves later. This move was Geller's novel conception - the simple but effective idea is to put the bishop on f4 and knights (if allowed) on e5 or even d6. The resulting line is the modern main line. Notice, incidentally, how Ne4 has reactivated White's worst placed piece. 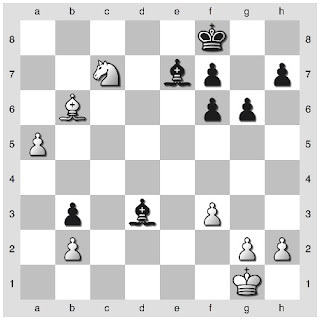 It may seem that this allows Black freeing exchanges, but watch how each of White's remaining pieces arrive at ideal squares before Black's. And the battleground has been set for a late middlegame where White looks to play on the c-file and the strongpoint on e5 after, say Nf3-e5 and Rc1. Meanwhile Black looks to play on the d-file. 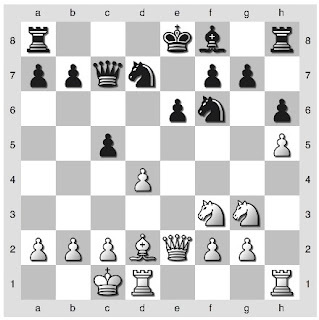 Notice how the pawn on g3 blunts Black's bishop, while the queen on e2 is perfectly placed to defend c4 and h5. White has been doing well here - scoring 60% by my database. Next time: kingside castling, the modern way. The Caro-Kann is a venerable defense to 1. e4 with history dating back to 1886, when Horatio Caro and Marcus Kann jointly analyzed the inauspicious looking 1....c6. Nowadays the Caro-Kann is favored by gray-haired ex-Soviets with a high tolerance for pain. 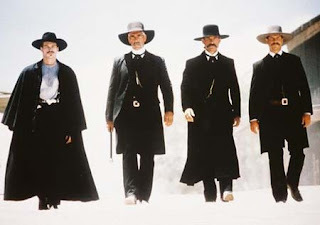 There are several principled variations White can choose from against the 'Kann, so players from the Black side have to be prepared for any of them. 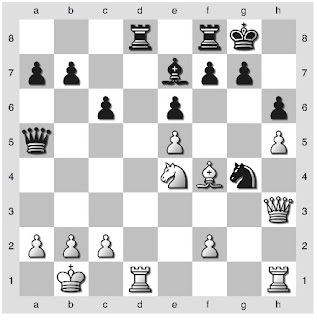 Not necessarily different from other openings in that respect, but the 'Kann more than others is built on defensive rather than counterattacking principles, and favors the player who is not averse to long grinds and opening-to-endgame transitions (along with occasional transpositions to 1. d4 openings such as the Queen's Gambit or Nimzo-Indian defense). 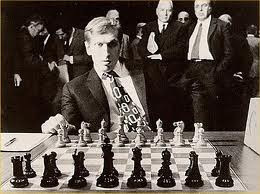 On the other hand the Caro-Kann has been a deadly weapon in the hands of positional masters like Karpov and Petrosian, and no less than Bobby Fischer famously had terrible problems from the White side - in his youth the Soviets discovered this flaw and bashed him with it relentlessly. I'll play 1. e4 if you promise not to play 1....c6. Deal? Since Bobby never saw fit to extend his excellent "Bust to the Openings" series beyond the King's Gambit, we'll take a look at one of his most troubled openings for a clear bust. Much to my surprise, a total refutation exists in the much-studied classical, or Capablanca, variation. Long thought to have been analyzed to a virtual draw, we will now prove this line to end in disaster for Black in all variations. Computer analysis and world champions may disagree, but rather than personally defeat the naysayers on the way to world fame I will share my insights with you, so together we can wreak havoc on the weekend quads of America. Not much choice for Black here - either he has to go into a Modern with 3....g6 or he will have trouble developing his pieces without the pawn exchange. 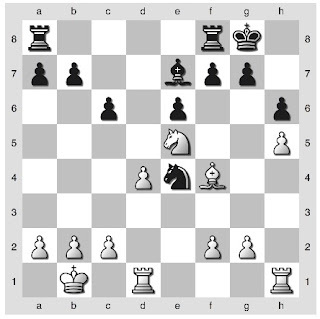 Now the question - Black gives White's knight a free ride the center, but what is it worth? The main move, most challenging. Black gets his light-squared bishop out of prison with tempo, and looks to play a favorable version of the Slav. Also possible are ....Nd7 or ....Nf6, though I think those lines lead to comfortable edges to White as a rule. Perhaps we'll return to those later. In recent times Black has also been trying ...Nf6! ?, letting the White knight jump into e5 with the threat to snap the bishop on g6. However, the bishop can retreat to h7 and Black seeks to prove that the knight on e5 is a weakness. Black delays the development of the knight on b8 with the hopes of getting in ...c5 and ...Nc6 (Gallagher points out that this move is a rare achivement for Black in the Caro-Kann). A subtlety worth exploring? This is one of the challenges in fighting the Caro-Kann - one must have the same tolerance for pain that a Caro player has. Again, perhaps we'll return to this later. And so Black has not only got his light-squared bishop into play but has exchanged it for White's LSB, a strong achievement! However, white concedes this as a prerequisite for queenside castling, which is the only way to leverage the advanced h-pawn in his favor through future kingside pawn advances. Now Black is at a crossroads with several choices that we will take a look at in the future. Where to castle? How to develop? 10 moves of theory but we're only halfway there. Tolerance for pain - respect it in your opponent, nurture it in yourself. Positional understanding must prove victorious. More later. Marathon and Chess...Sorry, No Golf! Last Sunday, KCC member Mike Wojcio runs his 114th marathon! Below, Mike taking a quick break at the 17 mile mark. Garry scribbled...Next time, wait at the end of the line. In the last round, Anand had his fate in his control. The task was simple - draw, and the title was his. For the third time in the tournament Anand faced the potentially dangerous Marshall attack, but he had a plan to pour cold water on the attack. With this draw, Anand finished in 1st by a clear point over the field. My impressions: Anand played critical lines in sharp openings round after round, and did not vary from this strategy even when he pulled into the lead. 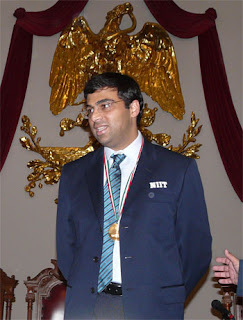 Well into the era of computer analysis, Anand continued to debate unclear positions with positional and material imbalances. He was rewarded with an impressive +4 overall score, including +1 =2 against the Marshall Attack and +1 =2 in the razor-sharp Anti-Moscow Gambit. Three of those draws came in tournament situations where a draw was a strategic victory. His only shortcoming came against the Petroff where he was not able to pose any problems against the world's experts in Kramnik and Gelfand. For their part, Kramnik and Gelfand can perhaps be faulted for a lack of ambition. Each finished 2nd on +2, but in the end settled for draws in those same Petroff games where they had their best practical chances against the future champion. Tactics fun on board 2....here in a tough position Black played 32...Ba3!? (cheapo alert), what is the cleanest way to end the game after 33. Bd4 Bd6? See comments for answer. 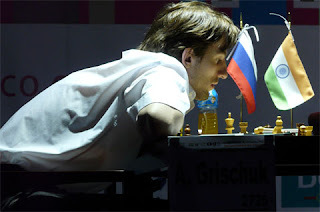 In the penultimate round, Grischuk displayed admirable fighting spirit by playing for the win and threatening to spoil Anand's championship run. Meanwhile Gelfand still had chances for overall victory and played a tense game against Kramnik on the next board. Looking for the kill....is it there? After this close escape, Anand was one step from the title. The only way he could fail is to lose and for Gelfand to win. But at least this meant the last round would be a fighting round.